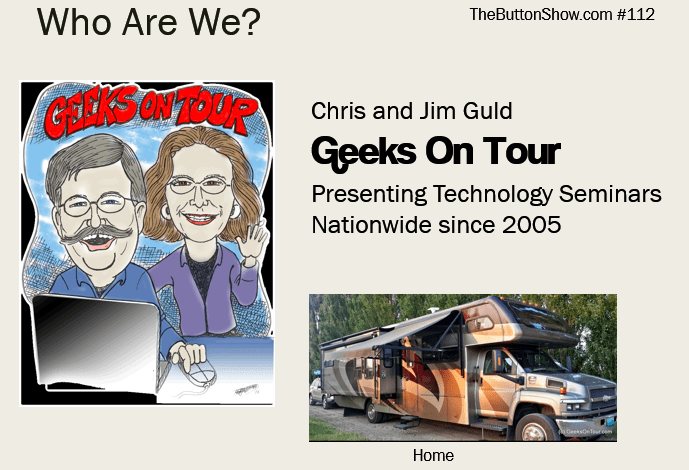 Beginning This episode is an introduction to Jim and Chris of Geeks on Tour and all about using the GeeksOnTour.com website to learn about using technology. Coming to you from Buckeye Arizona. If you notice that Jim sounds good and Chris sounds far away, that’s because she forgot to plug in her microphone but, you can still hear her thru Jim’s. Jim and Chris met back in 1993 when Chris owned a Computer Training center and Jim built the computers that she bought for the classrooms. 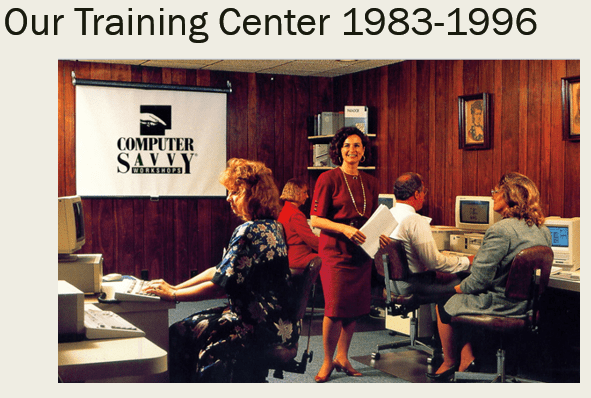 One thing led to another and Chris hired Jim as the network administrator for her business with 100 computers. Later they married and she sold the business. 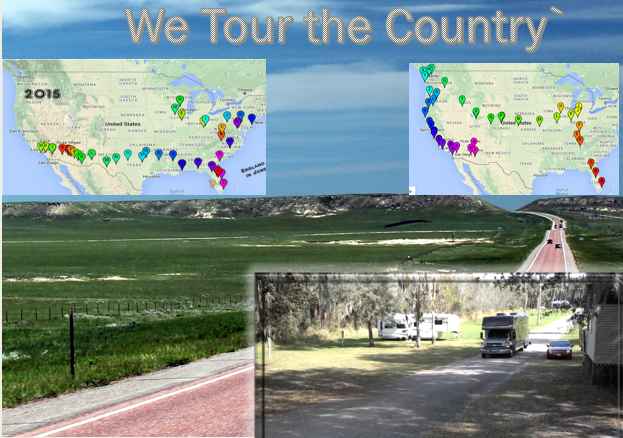 They bought an RV and sold their house in 2003 and have been on the road ever since. 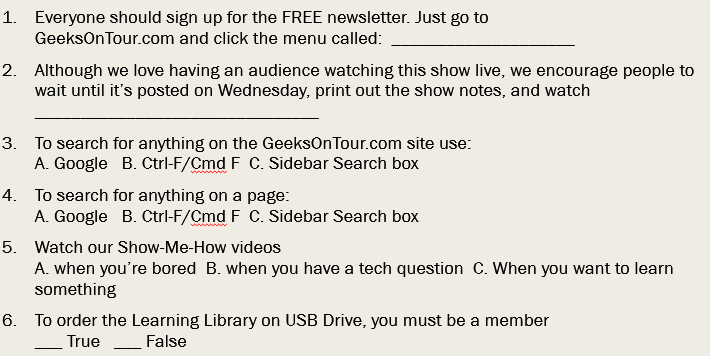 They started presenting seminars as Geeks on Tour in 2006 and the website has been growing ever since. We do live, in-person seminars across the country. If you sign up for our Newsletter, you will see the schedule of where we’re going to be and what topics we’re teaching. All the articles listed in our newsletters are actually separate posts on our website, so you can view All Articles and browse or search for a specific title. To search the page, use Ctrl-F on Windows or Cmd-F on Mac. To search the entire site for something, use the “Search this Site” Note: this is an exact word search. 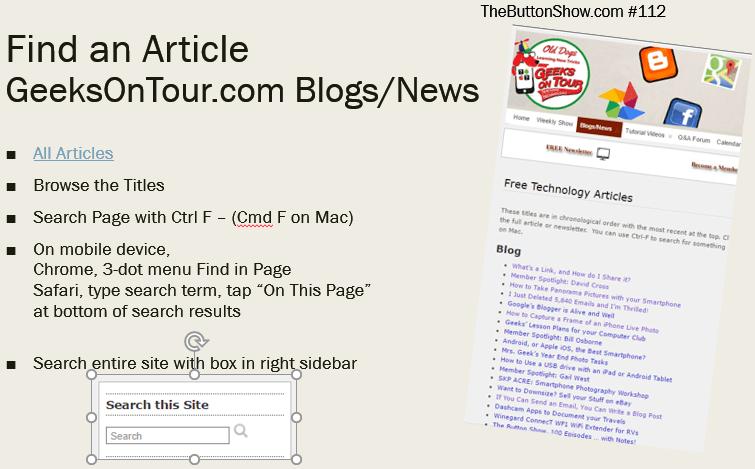 Once you find the page you want, you can then use the Ctrl-F search to find something on that page. This has always been our primary focus. 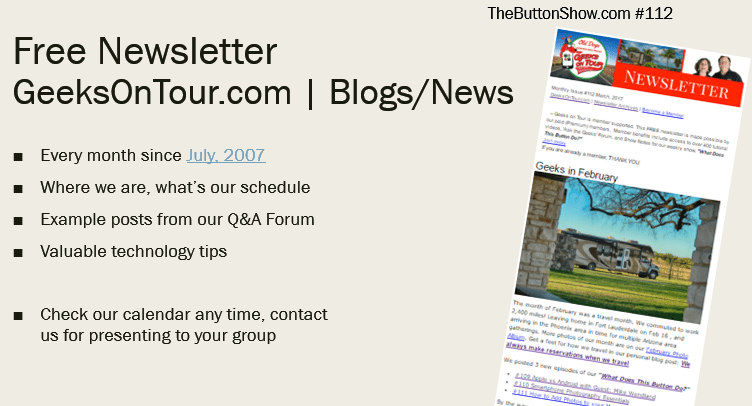 We’ve been making short, prepared, tutorial videos for the topics we teach since 2005. Each video is between 2 and 8 minutes long. Some of them stand alone, some of them are in a series. They are all collected on our website, and most are for Members Only. 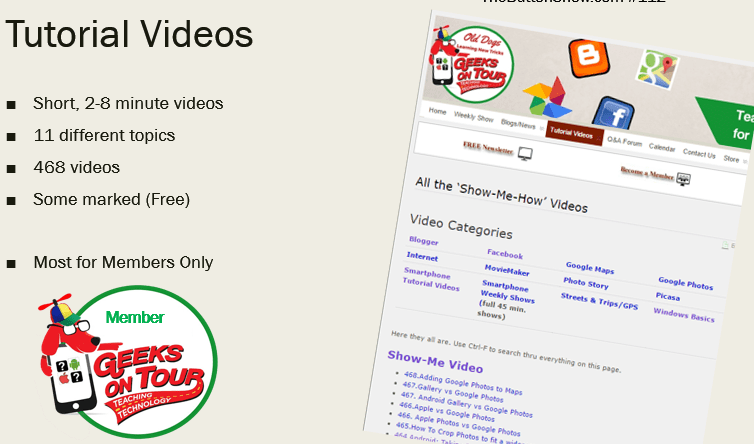 The main screen shows all the different categories of videos. Just click on a category to see all the videos. If you keep scrolling down the page, you will see a complete listing of all the videos in numeric order. The lower numbers are the older videos. The newest ones show at the top. Here is another place you can use the Ctrl-F tip to find a particular video. Especially if you have the number of the video – this is the fastest way to find it. Most of these videos are for members only. If you see the word Free in the title, that means you can view it even if you are not a member. 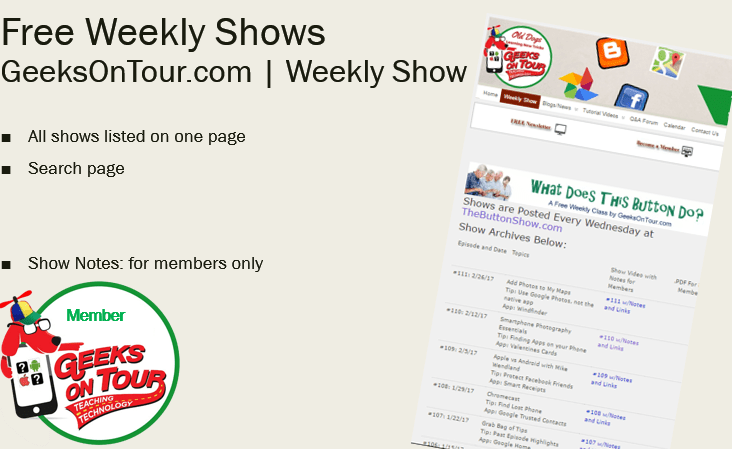 This is where the complete listing of all the shows are found. A recommendation: Don’t wait until you need to learn something to watch our videos. Watch them when you want some inspiration, when there’s nothing on TV. Treat them more like entertainment than work. Got 20 minutes with nothing to do? Watch a few videos, pick a topic you may have no clue about and watch a few. Now, you’ll be more aware of what is available in our videos and, when you do start to work on something, you can re-watch the appropriate videos. 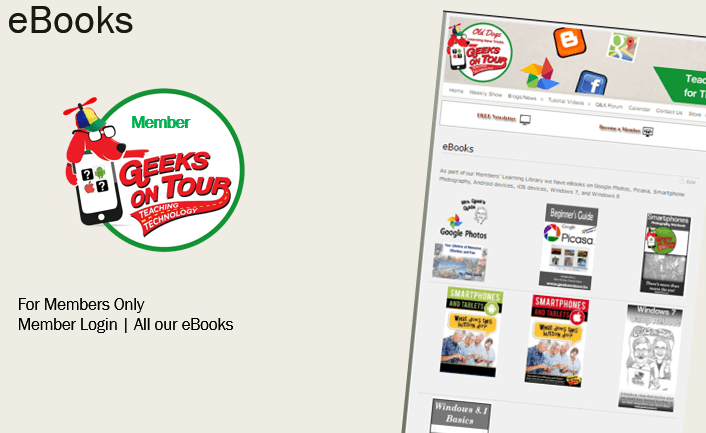 GeeksOnTour.com | Member Login … You’ll see a link to all our eBooks there on the welcome page after you’ve logged in. All the books are in .pdf format, you can read them on the screen or on a mobile device or you can print them out on your own printer. 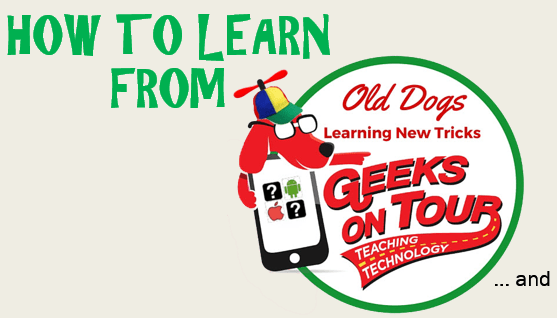 Mrs. Geek’s Guide to Google Photos is our most recent one. This is where you can ask any questions you have. Either Chris (Mrs Geek) or Jim (Mr. Geek) promise to respond. Anyone can search the forum and read any messages they find. Only members can ask a question. Please ask anything you want, but we especially like to hear, “I want to learn how to ___________, do you have videos on this and where are they?” So we can help you use our website to learn more. 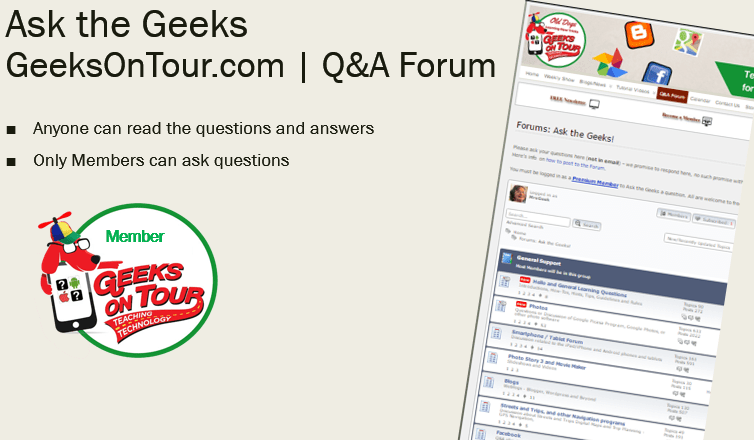 To ask a question, first pick a section, then click the button to “Add Topic” If you’re having trouble, here’s more info and a video on using the forum. 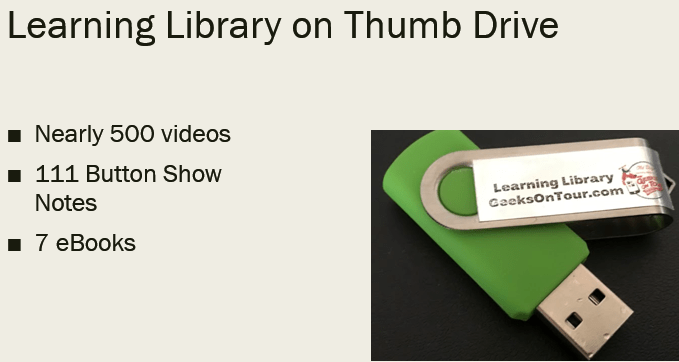 All of our premium content available offline by purchasing the thumb drive. Notice the folder for our eBooks – all 7 are in there. Also the folder for WhatDoesThisButtonDo – all 111 Show Notes are in there. The rest of the folders contain tutorial videos. This little Travel Router device is so cool. 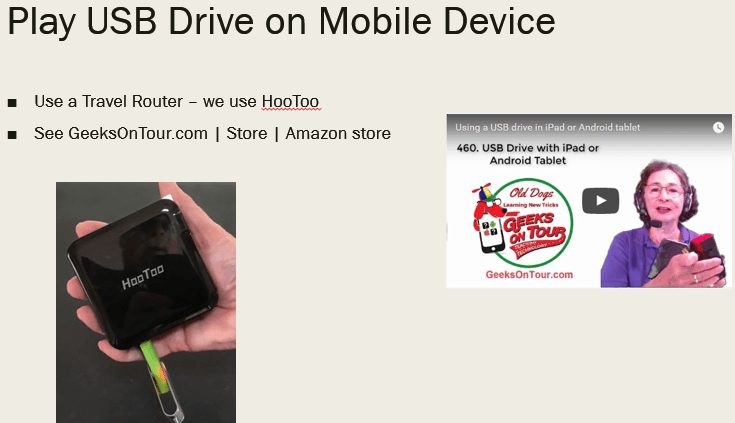 It does a few things (see episode 55), but our favorite is that it allows you to use your iPad or Android tablet to watch the videos on the USB drive. Ends at 40:10 Complete Playlist of What Does This Button Do shows.